It was a pleasure to be with you for those 13 miles. Someday (soon) we will get many more miles together! JL, are you in for the fall 50?!? I’m sure Brandon would love a running partner. It’s only a logistical question (I have dreamed of running that race in the gorgeous wisconsin autumn). There’s possibility that we will move to California at the end of the summer (we will know for sure at the end of June) and that would make it more difficult to run a race in Wisconsin. Oh yeah – and that’s totally true! Well hope it works out for you someday. I’m ashamed to admit that I hope you don’t make it to Cali. I know you want it, but I don’t and that’s what’s important right? Anyway, it’d be amazing if we could do this one together, but I know you will make the right decision for you and your family. I wish you all the best and God’s blessings wherever you end up. Love the altered ribbon! 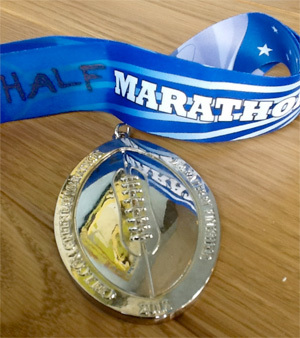 I had my “fake” medal engraved with “The Half-Fast Marathon / [my name] / 13.1 miles / [my time according to the text tracking]“. I like your idea even better. Even as I type this reply I’m considering signing up for Cellcom again. Late again. Paying the hefty late fee again. Weather looks good and Lambeau Field is calling! it could be more with respect to the number of Hummingbirds within your garden. after which rinse them thoroughly before refilling them. Many people recommend developing a hummingbird tattoo about the shoulder as it would look like the bird is perching on you. I think everything wrote was very reasonable. added a headline that makes people want more? I mean Impromptu Marathon RACE RESULTS!! how they write article headlines to grab viewers to click. Unclear About Installing movies? The Following Tips May Help!